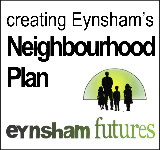 Eynsham faces many development-related issues and projects all seeming to happen at once, leaving many people confused about what is happening, when it is happening and feeling unable to respond in any meaningful way. inform residents when they can have their say during consultation periods. explain how residents can make their comments. explain the Parish Council's approach to the various proposals. publish the Parish Council's responses to consultations as they are made. The situation is complicated and it is quite likely that, if something isn't clear to you, it isn't clear to a lot of people, so please contact us if there is something you don't understand and we will add the clarification here.